A solid 2-0 home win for the Pars against a very stuffy Morton side. A superb goal by Stephen Simmons capped a fine performance by the midfielder. Following on from the midweek cup defeat Jim McIntyre could have been excused making a few changes to his side but he largely stuck with his core selection including playing himself in midfield. The Pars lined up with Paul Gallacher in goals. 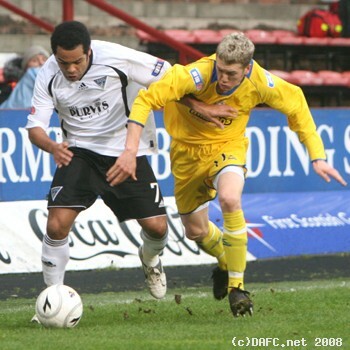 A back four of Woods, Thomson, Wilson and, making his last appearance for the Pars, Danny Murphy. The midfield saw Harper on the right wing, Simmons and Glass in centre midfield and McIntyre on the left. 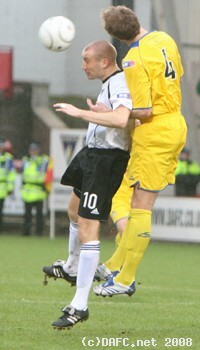 The established pairing of Burchill and Hamilton in attack. In cold wet conditions the Pars took the game to Morton. Calum Woods had a bit of a sclaffed shot in 2 minutes from 20 yards when he had time and space to connect. Paul Gallacher had to make a punched clearance in 4 minutes from a Morton free kick. There was a feeling the game was being played like a pre season friendly with little atmosphere being created by the 3,594 crowd. It was not until 13 minutes before the next action of note when Harper miscues a cross that troubles the Morton keeper who has to tip the ball over the bar for a corner. A corner in 16 minutes for the Pars saw Thomson head wide from a good postion. The Pars were playing some nice stuff without creating too much in the Morton 18 yard area while the visitors were quite happy to defend in numbers. Perhaps the best move of the half saw the Pars cut open the Morton defence with Burchill on the end of the move with a good header straight at McGurn. In 25 minutes a good cross by McIntyre from the left caused the keeper all sorts of problems and then a great save from a good header by Hamilton. There was a scare for the Pars when the normally assured Danny Murphy was dispossessed but fortunately Scott Wilson read the situation and made a great interception to clear. Jim McIntyre had a good header over from afree kick in 36 minutes as the Pars looked for the opening goal. It seemed that the only way Morton were going to cause the Pars defence problems was when the Pars themselves mucked things up as Wilson and Gallacher almost did in 43 minutes allowing a ball to bounce between them. Half time 0-0. The challenge for the home side was to keep the momentum going which they did. Danny Murphy won the ball in 50 minutes and a great cross was cleared. However, the breakthrough came a minute later and a cross from the left missed all the players rushing into the box but Stephen Simmons making a late run met the ball cleanly and drove the ball low into the net, a great finish from the midfielder who was, in any case, having a good game. Morton made a change and tried to get into the game with Wilson having to block a shot in 58 minutes but that was about as threatening the visiting side got. Somewhat bizarrely Simmons almost scored an identical goal to his first in 62 minutes, when he again arrived in the box late and connected with a cross from the left only to see his shot blocked by a number of bodies in his way. Kevin Harper still looks a little bit off pace and at times linked well with Woods but then failed to get forward to take the return. He did however set Woods up for a cross in 63 minutes which was cleared for a corner. The boss was also puggled and he was replaced by Nicky Phinn in 72 minutes with the youngster bring a new surge of energy to the midfield. Mark Burchill hit a great shot in 75 minutes that just dipped over the bar. Jamie Harris replaced Nipper who had taken a knock in 76 minutes. Morton were having a spell in the game when they were in the Pars half but the defence held up well without letting the Morton attackers get too close. Stevie Crawford replaced Harper in 82 minutes. Just as the home fans were expecting another tense last 5 minutes with a narrow lead but they were able to relax as Stephen Glass thumped a shot off the keepers left hand post and although the defence cleared it had gone over the line. There was just time for Nicky Phinn to show some brilliant footwork to escape three defenders and set Burchill up for a shot he hit over. Final score 2-0.